Two Mile House match-winner Niall Browne had a broad smile on his face as he recounted the moment that settled his club’s All-Ireland junior club semi-final. His high, hanging shot seemed to take an age to drop over the bar but it was definitely worth the wait. “I dropped about six short in the Leinster semi-final against Fenagh and I was getting crucified for two weeks after that so I’m going to enjoy this now. We levelled it late in the game and in fairness, we’ve been winning so many games late on this year that there is a kind of muscle memory there. We calm down now in the last five or six minutes which is in stark contrast to where we have been for the last four or five years so it is nice,” he said. That was his fifth point of the game and second in a row but Browne said that it was Chris Healy’s point in the 58th minute to bring Two Mile House back to within a point of their opponents that inspired him to kick those scores. “Chris was really good today, he was always showing for it and was hungry for it today. He was very closely marked but he certainly gave me a massive lift when he won that dirty ball and then scored the free, it gave everybody around a lift. It was huge turning point him getting that score,” he said. Browne has played through the years when Two Mile House thought they would never make it out of the junior ranks and played in close games where Two Mile House were on the end of a decisive injury time score but he feels there is a different mentality to the team this year. “Fate is weird. We’ve had such a tough run in and this year everything is going right but a lot of that is down to good mental strength. The young lads are very tough and strong. The older lads have got great enthusiasm from that. With four or five minutes to go we’d always back ourselves this year and that’s what made the difference in the end,” he said. Browne wasn’t even aware in the immediate aftermath of the game that Two Mile House had just become the first Kildare side to reach an All-Ireland club final. “I’m surprised by that. At the start of the Leinster campaign we weren’t really up for it and then we beat Drumbarragh. In fairness to Jarlath, he said ‘Look guys, you’ll enjoy this if you get up for it.’ After Drumbarragh we won a couple of games and we said that we’d go all out to win an All-Ireland title. The way we are looking at it is if we can’t win an All-Ireland junior title we won’t be near the mark at intermediate level. That’s the way for us to look at it, rather than worrying about Croke Park and big games like that, I think that could affect our performance. 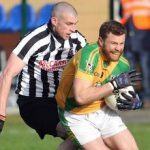 If we get to the level needed to compete at intermediate level, hopefully that will be enough to win an All-Ireland,” he said.